For fans of the TV show The Fall, this debut thriller is a fresh spin on a classic police procedural that explores the psychological implications of a life lived online. Ruby Day is a young vlogger, a rising star of YouTube, and a wholesome role-model to millions of teenage girls. And she is missing. Detective Inspector Kate Riley, the head of a new high-powered team of detectives, and Detective Superintendent Zain Harris, the newest member of the team and a poster boy for multiracial policing, are brought in for what they expect to be a routine runaway. Then a video of a wild-eyed Ruby running through the woods and begging for her life is posted online. Amid mounting hysteria and heightened media coverage calling for Ruby’s safe return, Riley and Harris must decode the dark secrets of this seemingly squeaky-clean internet darling. Their hunt leads them to a smug ex-boyfriend who hungers for online fame of his own, a culture of online cyber bullying by anonymous thugs, and a corporation of ruthless advertisers who exploit online celebrities for their network of eager consumers. It becomes increasingly clear that the case is more complicated and nightmarish than Riley and Harris could have imagined. And the videos keep coming . . . This debut novel is a slick, contemporary police procedural that explores the dichotomy of public life and one lived online. For fans of Megan Abbot and Kimberly McCreight, Cut to the Bone provides a harrowing glimpse into the friendships, ambitions, and secrets of the internet generation. I'm a big fan of the mystery genre. Whenever I fall into a reading or T.V. slump I know where to turn because mystery offers a wide range of options. From the classic whodunit to the traditional cozy I'll find something to perk me back up. 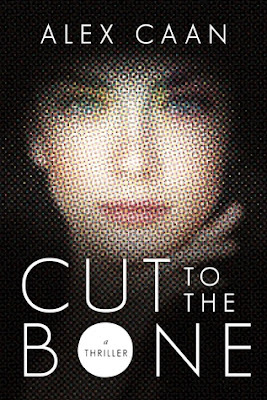 Cut to the Bone, Alex Caan's debut novel, is of the police procedural variety, however, it's one mystery that left me off-kilter. To me mystery is like pizza. I always expect it to be good, because it has simple elements put together to make something fantastic. You really can't go wrong, but sometimes you find a slice that just doesn't cut it. For me that slice is Cut to the Bone. Ruby Day is a vlogger who goes missing and is later seen on a video of her murder. The reason for this crime is unknown although the detectives first assume it stems from cyber bullying or tension between Ruby's producers, Mindnet. Reading this story was honestly a source of frustration. Mostly towards the middle and end, which left many plot points unresolved. Not only did a particular lead in the case of Ruby's kidnapping/murder get pushed aside, because it really had nothing to do with Ruby's murder, it was left blowing in the wind. Why let the characters pursue a lead to that depth that would not tie into the main crime. I understand the concept of using red herrings to make it seem as though the story is going in one direction when actually the answers lie elsewhere, but Caan put explicit attention on one lead that didn't even touch on the true culprit's motivations. The connection was stretched very thin. Then, the true culprit came out of left field with no previous suspicions placed on that character. I love when mystery follows a course that I can't get a jump on, but this story left no clues for me to attempt at making my own conclusions. Just waiting for Kate Riley and her team to recover information, dig for clues, and interview suspects wasn't enough for me. Even when interviews took place, like when Riley interviews Ruby's parents, the dialogue is forced in a repeated series of questions and answers. Every scene should serve a purpose, whether it's revealing a secret that leads to more clues or that a-ha moment when the detective finds a new way of looking at the case, but I'm sure readers don't want to sit through that type of dialogue to reach the purpose. Instead of adding suspense it makes me feel like the author is trying to slow walk me to a point that could just be stated. Police procedurals highlight the aspects of how police detectives solve crimes using certain methods like technology or forensics. I think Caan stuck with those aspects but overshadowed the usefulness of those tools by dumping too much detail into the scenes. If used in the right way a substantial amount of explanation can be used to give readers a feel for the techniques used, but here it seemed like overkill. Another aspect of police procedurals is a touch on the main character's dark past or drive to be on the force. There was some of that involved in Kate Riley and Zain Harris' characterization, but there were too many vibes that somehow Kate's past was going to pop up during the story. So while I'm waiting for something to happen to Kate she doesn't have an opportunity to confront her past. The story reverts to its original purpose -- to solve the Ruby Day kidnapping/murder. Whether I loved the concept used to develop a mystery, or not, by the end of the novel the mystery has to click and there be closure. I can appreciate where the author might have been going with Cut to the Bone, but the elements used to create this story just didn't fit in a way that made sense to me.